In mice, brown fat does something remarkable: it burns more calories when mice are overfed, protecting them from obesity. (Don’t you wish eating a plate of fries did that for you?) Furthermore, mice genetically predisposed to have with extra brown fat are actually leaner and healthier. In humans, there is evidence that more brown fat is associated with a lower body weight. So, how might we increase our brown fat production? The team led by the University of Pennsylvania figured out the switch for creating a brown fat cell—a protein called early B cell factor-2 (Ebf2). 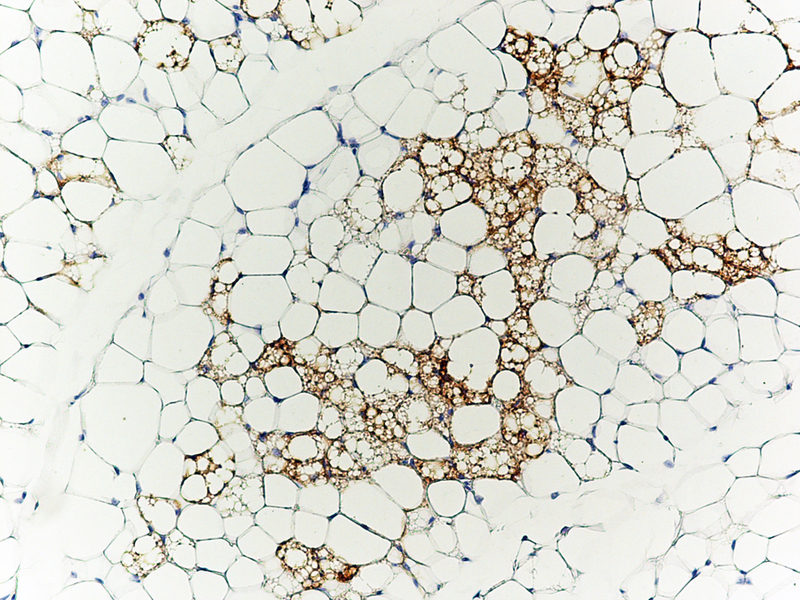 Comparing the active genes in brown and white fat cells, they discovered Ebf2 is present in larger quantities in brown fat. This protein seems to mark which genes will later be turned on to transform certain types of precursor cells into brown fat. When the team engineered mice lacking this protein, the animals had white fat cells on their upper back and spine rather than the typical brown. When the team expressed high levels of Ebf2 in white fat, these cells turned brown and consumed more oxygen—a sign they were producing more heat. The second team, led by Harvard’s Joslin Diabetes Center, noted that mice have two types of brown fat: constitutive brown fat, which they have from birth, and “recruitable” brown fat, scattered throughout the muscles and white fat. When researchers engineered mice lacking a protein called Type 1A BMP-receptor (BMPR1A)—which is needed for the correct development of brown fat—the mice were born with just a tiny bit of constitutive brown fat on their back. You would think that these mice would be terribly cold. Surprisingly, they kept a normal body temperature. How did they manage this feat? The lack of brown fat apparently sends a signal via the brain to the recruitable fat cells, telling them to make the switch and transform into brown fat. The mice stayed warm, and the recruited brown fat even protected them from obesity. In humans, too much abdominal white fat promotes heart disease, diabetes, and many other metabolic diseases. It would be potentially therapeutic if we could transform some of our white fat into brown. Determining which genes control the development of white and brown fat may be the first step toward developing game changing treatments for diabetes and obesity. Extremely interesting article given the increase prevalence of obesity. It would also be interesting to see whether lifestyle can have any influence on the expression of these genes once when they are being identified. How could we transform some of our white fat into brown? Thanks for your question, Jorge Luis. The work highlighted by Dr. Collins involved genetically engineered mice. So, more research needs to be done before we can consider transforming white fat into brown fat in humans. So liposuction removes white fat? Is that good? Seems to me that your article does not tell us how to get more brown fat. Good question, James! Because the studies mentioned in this blog post were done in genetically engineered mice, they tell us very little, if anything, about the health effects, good or bad, of liposuction in humans. PLEASE LET ME KNOW WHEN YOU FIGURE OUT HOW I CAN CHANGE THE FAT IN MY MIDDLE INTO GOOD FAT. I HAVE BEEN TRYING TO DO THAT FOR YEARS. IT WOULD DEFINITELY IMPROVE MY HEALTH. Both diets were associated with sustained reductions in weight and plasma lipid concentrations. In an analysis controlling for medication changes, a low-fat vegan diet appeared to improve glycemia and plasma lipids more than did conventional diabetes diet recommendations. Whether the observed differences provide clinical benefit for the macro- or microvascular complications of diabetes remains to be established. This trial was registered at clinicaltrials.gov as NCT00276939. I know someone who did that diet and ended up in the hospital with glucose at 800. Protein is critical. My brother and sister-in-law have been on the Dr. Atkins Diet for almost two years, now on the maintenance portion. Both have eliminated body fat, high cholesteral levels and abdominal fat! She has reduced her dependence on insulin, now considered non-diabetic. At 67, they are both healthy. How can this be explained? Protein, veggies, complex carbs. It’s very good, some people call it Paleo. Oh, and GOOD fats like olive oil. nice to know about brown fat , would like to know more on how to make white fat to brown fat ASAP, please inform. Interesting, nice lunch time read, as I stuff my face with bacon cheeseburger and fries. Question: anyone know if Ebf2 interacts with Swi/Snf, as Ebf1 does? Just curious. Some people take ice baths and cold showers to (try to)activate brown fat and boost the metabolism. … (others try) exercise and intermittent fasting … (to) convert WAT to BAT. Great source of information!Extremely interesting article given the increase prevalence of obesity. Does the thyroid also come into play? I know it touches on weight as well as temperature regulation. Could it be a contributing factor in the balance between white and brown? obesity is the main problem nowadays. And Dr. Francis Collins your all articles are wonderful and interesting. Very excellent article. Only now do I realize that this many types of fats are in us. One meal, with a soda, can stack up to be over 1,500 calories. That’s just about the daily limit for the day and it may not even fill you up for long. This is very interesting post indeed! If I understand this correctly, brown fat is the good fat. So does that mean we need more of it in our body in order to get the benefits from it? Wondering if the reduction of brown fat over years or, its reverse, building up brown fat, can help regulate body temperature in the aging population? This would seem useful for older people that struggle to stay warm. Interesting long term applications…. I would be interested in how they are going to go forward with their research. Is the next step human studies or do they go onto other mammals? I guess it will be a long time before we get any firm findings, but I would definitely love to hear more about it. Although I do think that obesity and heart disease can be controlled by healthier eating in general.